Why Choose Homgeek 8-inch Chef Knife? The German-made knife is strong and can be used in tough tasks. It will also maintain its toughness and functionality for a long time. The weight and size of the knife feels quite balanced and the user won't feel bogged down because of its weight. It also has good ergonomics that minimize the possibility of experiencing aches and cramps on the finger especially even after long use.long-term use . if you receive a product of which package is beat up or blade has broken off,not from abuse,please contact us and we will replace it or refund you! DO NOT chop bones or use the knife to cut on hard objects and surface like glass cutting board or granite. ★Before first use, please clean the knives, please avoid direct contact with blade edge! Don't test with finger tips. ★Wipe your blades with gentle water and dish soap, rinse clean and towel dry immediately. ★To maintain your knives, please wipe away the water and keep dry and clean. ★Use the knife for a long time, the sharpness will drop, then you need to use the correct sharpening tool to restore its sharp. If you do not mind, the knife sharpener could be searched in Homgeek store. [GERMAN STAINLESS STEEL ]-- This chef knife is made of German high carbon stainless steel that resist s rust, retains sharpness longer than average knife. No worry about being obtuse after unsuitable use, here comes our Homgeek Diamond Coated Knife Sharpener to solve your problem. [ERGONOMIC PAKKA HANDLE]-- The handle is made from Pakkawood, which is a material that known for its comfort, strength and stability, yet feels soft and comfortable. 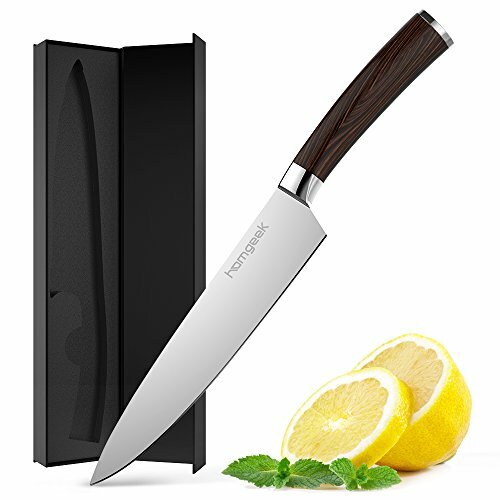 [ULTRA SHARP BLADE]-- This 8" long kitchen knife is sharp and in high hardness, has extraordinary performance and perfect grain, working well in slicing, dicing, chopping, mincing and more. [ANTI-CORROSION]-- This chopping knife also includes 16-18% chrome in the blade's metal composition. This gives its a glossy finish which will not fade or tarnish even after using it for a long time. [LIFETIME WARRANTY & ELEGANT PACKING]-- Lifetime warranty, also comes with a elegant packaging which can be a nice gift for friends or familys. If you have any questions about this product by Homgeek, contact us by completing and submitting the form below. If you are looking for a specif part number, please include it with your message.